An historical decision in Amsterdam makes official the Santo Daime religion in the European Community. The fraternity is commemorating all over the world. On this Monday, April 21, 2001, the Amsterdam criminal court announced Freedom for the Santo Daime religion!! The Dutch Court accepted the arguments of the defendant's lawyer, Adele Van der Plas, that Santo Daime's Church is officially recognized as a spiritual doctrine in Brazil and that the use of Ayahuasca is accomplished under a sacramental / religious context. Therefore, its use is under the protection of the European Agreement of Human Rights, especially in the text of the article 9 where the religious freedom issue is treated. The judges decided that "Ayahuasca doesn't represent any danger for the public health in the way as it is used at Santo Daime's Churches", what means that the Dutch government cannot interfere in the subject. See below Arno Adelaars's report about the decision, directly from the court in Amsterdam. Court Case in Holland against the use of ayahuasca by the Dutch Santo Daime Church. 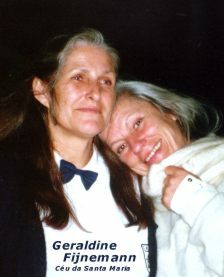 Amsterdam - On Monday 21 May 2001 Geraldine Fijneman, head of the Amsterdam branch of the Santo Daime church was acquitted by the court. Judge Marcus and his two colleagues decided that, although it was proven that mrs. Fijneman had owned, transported and distributed a DMT-containing substance, her constitutional right to Freedom of Religion must be respected. In the verdict, the court first argued that several arguments of the defense were not valid. The court said the preparation of ayahuasca was not a simple preparation, because it was a mixture of two plants. Therefore, the line of defense that Adele van der Plas used in the second session, based on the "Commentary on the Convention on Psychotropic Substances, done at Vienna on 21 February 1971" (United Nations, New York 1976 E/CN.7/589) was not valid, since the notes 1227 and 1228 of article 32 paragraph 4 were about simple preparations of one type of plant. The court agreed with the defense laywer that the Santo Daime church is a serious and bonafide religion, and although ayahuasca contains the scheduled substance DMT, it is considered the holy sacrament without which the defendant can't profess her religion. The court declared that according to article 9 paragraph 2 of the European Treaty of Human Rights every person has a right to profess his religion, unless there is threat to public safety, public order, public health or good manners. The prosecutor argued that ayahuasca was a threat to public health, but didn't give any proof of public health risks involving the use of ayahuasca said judge Marcus. The judge stated that expert witness toxicologist De Wolff had declared there were currently no public health risks concerning the use of ayahuasca within the setting of a Santo Daime service. Both the defendant and the laywer were not present, they left for Brasil last week to attend ayahuasca ceremonies, and therefore couldn't make comments about the case. It is quite likely that the defense will demand the return of the confiscated 17 liters of ayahuasca and will demand a compensation for the time the defendant was incarcerated. Arno Adelaars Amsterdam -The Netherlands.